Spurred on by the awesome Jon Topper's talk of goat's cheese and butternut squash Lasagne, I decided that the time had come to make my first home made Lasagne. As TFH is a meat-loving bloke, I decided to improvise a little. Then, when I got to Sainsbury's, I couldn't remember what all the ingredients were, so I improvised a little more. Put the oven on and when it's hot (around 180), put the roastable veg in a tin with some olive oil for 30-40 minutes, until nicely roasted. When they're done, take them out of the oven and start everything else, turning the oven up to 200. Take a large frying pan or wok type pan and add some oil to it, then chuck in the chicken so it can brown. While you're doing that, boil the kettle and put two large (or however many you need) sheets into a flat dish where they can soak for a bit, while you do the other stuff. Try not to let the chicken burn as you get the stuff for the sauce ready. When it's brown, chuck the pasta sauce and the pesto in on top of it, along with the roasted vegetables. Mix it all together, breaking up the bigger bits of chicken and veg, and let it simmer for a bit. Watch the white sauce video, and follow the instructions (they work!) and when the sauce has cooked, add some cheese to it and stir it in well. Take your dish and lob about half of the chicken and veg mix into the bottom of it, covering it with a (drained) sheet of pasta, then spread about half the sauce over the top. Repeat with the other half of the filling, another sheet of pasta and then the rest of the sauce. Grate some more cheddar over the top and add some parmesan. Stick it in the oven for 20-25 minutes at 200, until it's golden brown. Give it a few minutes to rest when it comes out of the oven, otherwise you'll burn your mouth because it's so good but too hot at the same time. 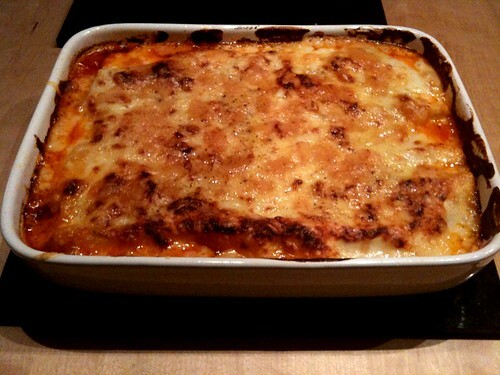 This will make enough for 4 people, or two very hungry people who like eating leftover lasagne the next day.